HARTLAND, Wis., (December 8, 2014) — Dorner Mfg. has introduced new pallet system components for use on its 2200 SmartFlex flexible chain conveyor platform that provides accurate positioning and routing of parts for assembly, robotic and inspection applications. 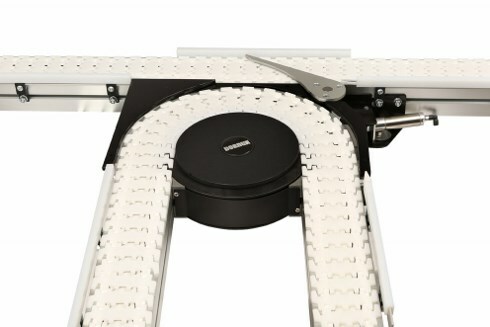 The components, sold as completed assemblies or as kits, allow users to implement easy design changes to their conveyor systems and offer versatile layout flexibility. Introduced in 2013, the 2200 SmartFlex reduces costs, saves time and offers simple configuration and acquisition options to Dorner’s customers within the food, medical, life sciences, industrial automation and packaging industries. The new pallet systems provide users with greater customization capabilities to benefit assembly and other similar processes. Pallet system components include merge and divert kits, a lift and locate station and pallet stops. Learn more about Pallet Systems here.